St. Louis and Kansas City hug the opposing borders of Missouri. Interstate 70 stretches the nearly 240 miles between these two great cities. Almost exactly in the middle you will find the city of Columbia and the University of Missouri. You might come here for an NCAA sporting event hosted by the Missouri Tigers. It could also be that you just need a stop while traversing the state. Either way, if you would like to take a break and enjoy nature, then you can find it here. We lived in Columbia for a short while, and now, we make sure to stop by any time when passing through. Here are our four, favorite, easy, quiet retreats in Mid Missouri. Shelter Gardens is a stunning five acre garden that is part of the Shelter Insurance corporate headquarters in Columbia. Browsing through the gardens, you will find a plethora of trees, shrubs, and flowers arranged in beautiful settings. A replica of a small, one room, school house is fun for kids to explore. A waterfall and reflecting pool are tranquil and picturesque. Our favorite section is the sensory garden. Designed for the visually impaired, it features a multitude of herbs and aromatic flowers that are a delight to sniff. Take a small pinch from an herb, rub it between your fingers, and enjoy. Shelter Gardens is located near I-70 only a block off of Stadium Boulevard. It is free and open from 8 a.m. until dusk daily. 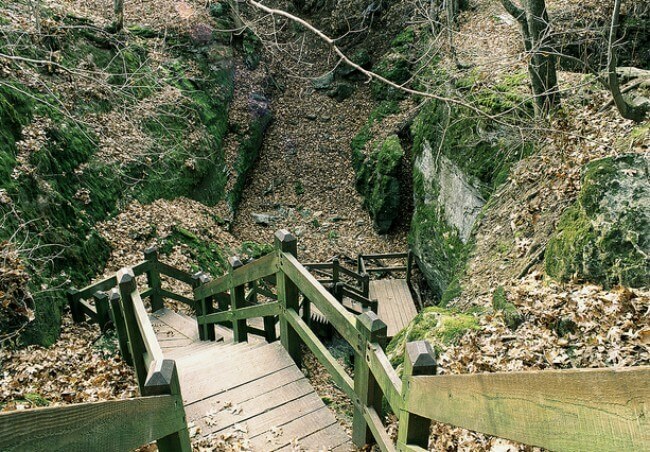 Rock Bridge Memorial State Park has over two thousand acres of woods with miles and miles of scenic trails. You will find the park just 5 minutes south of Faurot Field, where Missouri plays its football games, on Highway 163. Our favorite section is the Devil’s Icebox Trail. This 2.5 mile, boardwalk path takes you through hardwood forests past the Rock Bridge and to the Devil’s Icebox. 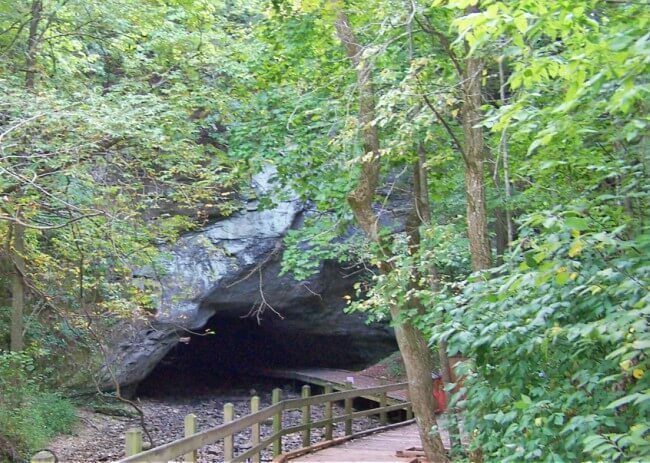 An over 60 foot tall rock arch with a cave-like pass forms the Rock Bridge. The highlight to us is the Devil’s Icebox, though. Down some stairs off of the main path, you descend into the mouth of a cave. With a steady temperature in the mid 50s (about 12 celsius), it provides a welcomed cool break in the summer. Or, a warm burst in the dead of winter. Better than this are the bats. Bats everywhere! Zipping in and out of the cave and all around. The Katy Trail is a rail to trail path that follows the Missouri River as it crosses the state. There are access points all across the middle of Missouri. The Katy Trail does not run directly through Columbia, but it is linked to the center of the city and the Mizzou campus by the MKT trail. The MKT trail takes you 9 miles from Columbia, through woods and wetlands to the Katy trail. One of the most scenic and popular stretches of the Katy Trail is at the town of Rocheport, just a few miles west of Columbia. Whether taking a short walk, a long run or hike, or a relaxing bike ride, the MKT and Katy Trails will give you a scenic break from the town or highway. 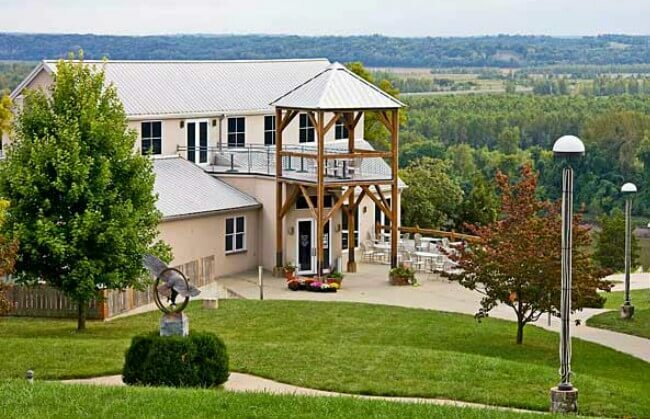 Just a short walk up the hill from the Katy Trail or a short detour off of I-70 at Rocheport takes you to Les Bourgeoise Winery and Bistro. For a relaxing afternoon or evening meal with brilliant views of the Missouri River, you cannot top a stop at Les Bourgeoise. The Blufftop Bistro serves a large and diverse menu of delicious dishes made mainly from local farm fresh products. The winery is also highly regarded. A stop here will be a highlight of a drive across mid Missouri or a nice, side-trip at a Mizzou game. 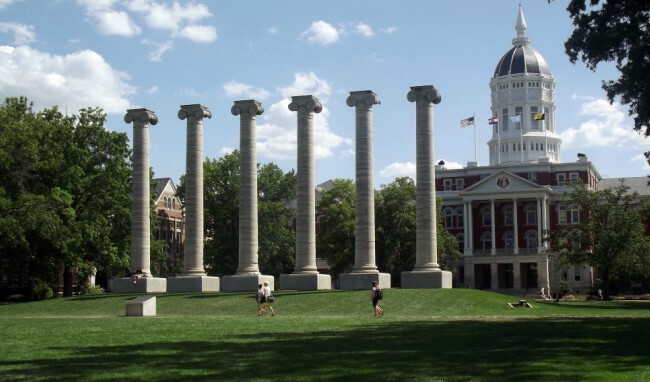 If you are an SEC football or basketball fan, or if you plan to travel through the Midwest, then you will likely find yourself in Columbia, Missouri. 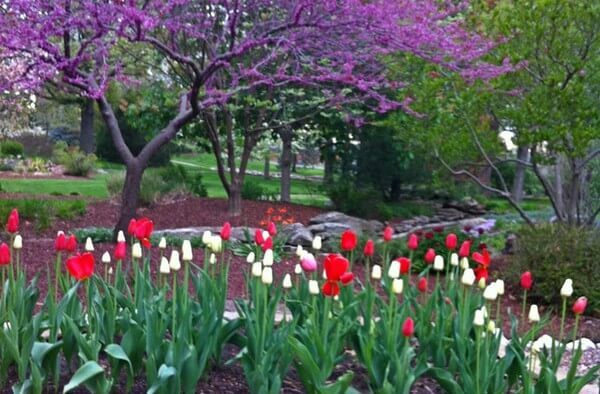 Visit the beautiful University of Missouri and the eclectic downtown shops and restaurants. But, do not forget or miss out on the Easy, Quiet Retreats in Mid Missouri. Missouri has some really beautiful places to visit. I would love to see the Shelter Gardens, it seems like the perfect place to relax. We have travelled much of Missouri and there is a lot to see. If you are ever driving along I-70, Shelter Gardens is about a 5 minute detour at most. I love quiet places! And this isn’t too far from me in Illinois. Thanks for the post! I am glad you liked it. You have a wonderful site. I live your theme. Nature, parks, and quiet spaces are my favorite, too.